Hey snow lovers! 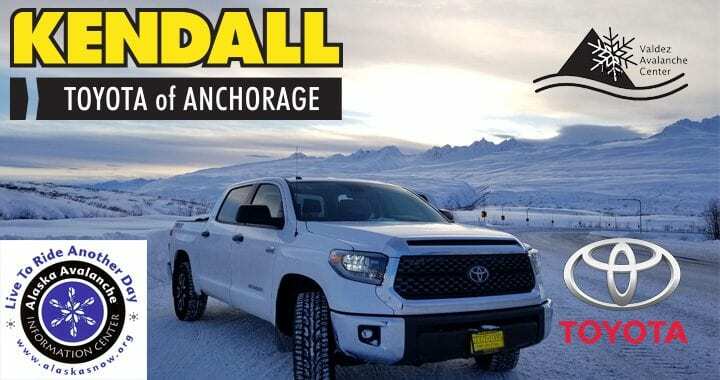 The Alaska Avalanche Information Center here with your weekly trails report thanks to Kendall Toyota of Anchorage and Classic Country 100.9. Sunshine and warm temperatures have returned and are expected to continue through the weekend. Forecasters and observations from across the state caution riders to beware of a highly moisture saturated snowpack in all coastal and proximate lower elevations. Always check the latest forecast at Alaska Snow dot org before your next tour. Trails across the state are open and spring is here. Get out and get it before it’s gone! But it’s no time to get loose with the safety routine. Watch out for your friends, emphasize communications, and don’t be afraid to turn around when it’s right for you. Avoid accidents and injury and help others by checking the weather and snow conditions before heading out and sharing your photos and observations of potential hazards. Thanks to support from ABC Motorhomes and the City of Valdez, the AAIC and VAC will host free backcountry safety workshops each week in Thompson Pass now through mid-April. Visit the calendar at Alaska Snow dot org for more information. That’s it for this week. Stay safe out there and take care of your friends so you can all live to ride another day! Posted in AAIC News & Announcements, Snow Reports.